Then enjoy an active resort holiday and dive into an unforgettable underwater world. Experience the unique, fascinating weightlessness, peace and exoticness of the underwater world. The diving school MAGIC Divers allows both young and old to familiarise themselves with the basic techniques of diving with a taster course. You can then start diving yourself under professional instruction. Book your diving holiday in Egypt at TUI MAGIC LIFE Kalawy or TUI MAGIC LIFE Sharm el Sheikh. The diving centre is operated by TUI MAGIC LIFE in its 10th year and is located directly on the beach. It provides over two acclimatised theory rooms, a storage room each for private diving equipment and one for rental equipment, a large filling station for Nitrox and a shaded court. The Red Sea is considered to be one of the world's prettiest and most flamboyant divers' paradises. The temperatures of this tropical water never drop below 22°C. As it is nearly an enclosed sea area in which no rivers flow the water of the Red Sea is extremely clean and transparent. However the major attraction for divers and snorkelers definitely are the numerous fringing reefs. The diving site can be conveniently accessed via the hotel owned, stable jetty. The team transports the equipment to the platform, from where the reef is accessed. Exit is via the dive ladder. Directly beneath the access point is a sandy platform, approximately on 5 meters depth, where a large coral block is located. Towards the outer reef the seabed gently slopes to a depth of 20 meters. 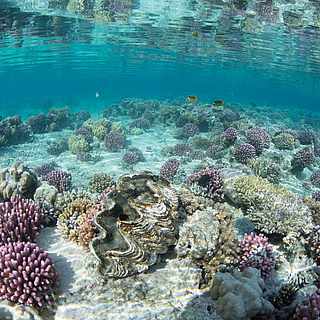 The fringing reef is heavily overgrown with hard corals and offers livelihood to many fish species. In particular blue spotted rays and moray eels are to be encountered very often. The diving centre provides over 3 "Coltri" ventilating air compressors with an air supply performance of 1800l/min as well as a large Nitrox membrane system. The diving centre is open 7 days a week throughout the whole year. In order to participate in our diving activities you have to present an international diving licence and a logbook. The first dive is a "welcome dive" on the house reef. Independent dives are possible for divers aged 15 years and older, providing over Open Water Diver (OWD) experience and 25 logged in dives on the house reef. For the Junior Open Water Diver 40 logged in dives need to be presented. Independent dives are only possible when accompanied by a dive master. Trial dives in the activity pool: Trial diving is offered every Monday and Friday between 3:45 and 4:45 p.m., reservation is not required. Diving can be tried and thereafter registration for the diving course on the following day is possible. The course Scuba Diver (Open Water Diver) starts directly on the next day (Tuesday/Saturday) at 9 a.m..
Day trip Safaga: At day trips the manifold dive areas of Safaga will be visited with a large ship. Two dives will be completed. Next to the legendary dive areas such as "Panorama Reef", "Middle Reef" and "Salem Express" also places like "Tobia Arba" and "Abu Soma Garden" will be called at. The Scuba Diver license (SSI Scuba Diver course, equivalent to CMAS Basic) entitles the holder to dive accompanied by a diving instructor in protected water up to 12 meters depth and thus represents the first step of the basic training with basic diving experience. Admission requirements are as follows: 10 years and older as well as a valid medical certificate confirming diving suitability. The duration of the course is two days. Completion SSI Open Water Diver (equivalent to CMAS Bronze / Einstern) The OWD diving license is an independent diving level which authorizes the holder to dive up to a maximum depth of 18 meters, when accompanied by a likewise experienced diving partner. The OWD diving license is also prerequisite for all further diving courses. Admission requirements are as follows: 10 years and older, a valid medical certificate confirming diving suitability as well as the successfully completed basic diving license (Scuba Diver). The duration of the course is one day - participation in this course is only possible with the completed Scuba Diver course. As part of the SSI award program it is possible to become a specialty diver with 12 logged in dives and two completed special courses. Among other, these special courses might be Nitrox, Night, Deep, Photography, Wreck and many more. Admission requirements are as follows: 12 years and older, an Open Water training and a valid medical certificate confirming diving suitability. Depending on the combination of courses the duration is 1-2 days. The diving centre is operated by TUI MAGIC LIFE since March 2002 and is located directly on the beach within the hotel premises. It provides over an acclimatised theory room, an equipment room, a storage room for private diving equipment, a large compressor room with workshop, outside showers with washing facilities as well as a shaded outdoor place. The Red Sea is considered to be one of the world's prettiest and most flamboyant diver's paradises. The temperatures of this tropical water never drop below 22°C. This and the high salt content are the reasons why the Red Sea is a unique biotope. As it is nearly an enclosed sea area in which no rivers flow the water of the Red Sea is extremely clean and transparent. However the major attraction for divers and snorkelers definitely are the numerous fringing reefs. These sensitive eco systems offer shelter and nourishment for thousands of species whose coexistence is linked by complicated food chains. The Red Sea is synonym for a unique diving area which contrasts sharply to the world over water and resembles a colourful paradise, virtually overflowing of life and colours. The base is equipped with rental equipment from "Mares", "Scubapro" and "Aqualung". The diving center provides over 3 ventilating air compressors. In order to participate in our diving activities you have to present an international diving licence, a logbook and a medical certificate (which needs to be renewed every second year up to the age of 40, thereafter it needs renewal each year and can be issued by your GP). Independent dives are possible for divers aged 15 years and older, providing over Open Water Diver (OWD) experience and 25 logged in dives on the house reef. For the Junior Open Water Diver (up to 15 years) 40 logged in dives need to be presented. Independent dives are only possible when accompanied by a dive master. The Scuba Diver course permits a diving depth up to 12 meters and represents the first level of the basic training. Divers need to be at least 10 years and older and possess a valid medical certificate confirming diving suitability. The duration of the course is two days. The OWD diving licence is an independent diving level which authorizes the holder to dive up to a maximum depth of 18 meters, when accompanied by a likewise experienced diving partner. The OWD diving licence is also prerequisite for all further diving courses. Admission requirements are as follows: 10 years and older and a valid medical certificate confirming diving suitability. The duration of the course is three to four days. An upgrade from Scuba Diver to Open Water Diver can be obtained at any time in only two days. Required are several pool and theory lessons, two further dives and an exam at the end of the course. The Nitrox diver certificate entitles the holder to dive with Nitrox mixtures up to 40% oxygen, enables a longer diving period and less exhaustion at the end of the dive. Admission requirements are as follows: 12 years and older and a valid medical certificate confirming diving suitability. The duration of the course is one day. As part of the SSI award program it is possible to become a specialty diver with 12 logged-in dives and two completed special courses. Among other these special courses might be Nitrox, Night, Deep, Photography, Drift, Wreck and many more. Admission requirements are as follows: 12 years and older, an Open Water training and a valid medical certificate confirming diving suitability. The duration of the course is one day. The AOWD course offers the possibility to combine five special courses. New knowledge and tricks are being imparted, i.e. deep diving, navigation, drift, boat dives, under water photography, fish ID or night dives. PADI AOWD consists of 5 lessons which are completed in theory before the dives. Mandatory special courses are deep diving and navigation as well as 3 further special courses at participant's option. For the SSI Advanced Adventurer participant can choose his five special dives. Course material or tests are not required. One option for a special course is Nitrox 32%. Special courses already completed will be counted. Admission requirements are as follows: 12 years and older, the international diving certificate and a valid medical certificate. The duration of the course is three days. PADI, Barakuda and CMAS courses are available upon request.